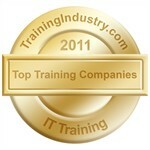 Firebrand Training has been named in the Top 20 IT Training Companies in the World. We've won this award twice in a row. Ken Taylor, Chief Operating Officer of TrainingIndustry.com said: “Our Top 20 IT Training companies stand out as the best providers in a very competitive segment of the training industry. Companies demonstrated that they could cover a broad range of topic areas in the modality of choice for their clients”.